Here's the pattern for very confident beginners or intermediate knitters (no schematic drawing or measurements provided). Knit it up in a tighter gauge than you would normally knit up the yarn you choose. I used Lamb's Pride Worsted. Gnit a Gnome You will gneed: yarn, stuffing, felt, beard fleece, gnitting gneedles, a felting gneedle (for attaching the beard), a yarn gneedle (for sewing up), an embroidery gneedle (for attaching soles and for sewing the head gathering stitch and the leg-separating and arm-separating seams), and button or quilting thread (for sewing the head gathering stitch and the leg-separating and arm-separating seams). Gnotes: You will use garter stitch for the whole figure and for the hat. Always change colors at the same (right) side of the figure, breaking the working yarn and leaving 6” tails of yarn ends as you work. On the other (wrong) side of the figure, you will see stripes where the colors meet. GNITTING THE BODY (from the shoes up to the head) 1) Cast on 30 stitches of yarn for the shoes and gnit 8 rows. 2) Switch yarn and gnit 12 rows for the pants. 3) Switch yarn and gnit 16 rows for the shirt. 4) Switch yarn and gnit 5 rows for the head. You are now on a wrong side row. Gnit 14 stitches. You will now make a bobble for the gnome’s gnose: Knit into the next (15th) stitch three times by knitting into the front of the loop (leaving the 15th stitch the left needle) then knitting into the back loop of the 15th (leave the 15th stitch on the left needle), then knitting into the front of the loop of the 15th stitch again. Move all the three newly created stitches back to the left needle. Knit all four stitches (the new stitches and the 15th stitch together. Gnit the remaining stitches of the 6th row and then 9 more rows. 5) Decrease stitches on the 16th (final row) by knitting every two stitches together. 6) Bind off the remaining 15 stitches. 7) Push the gnose bobble toward the right side of the piece. GNITTING THE HAT 1) Cast on 30 stitches of red yarn. 2) Gnit one row. 3) Gnit together the first two and last two stitches of the next row. 4) Repeat steps 2 & 3 until two stitches remain and gnit those two stitches together to bind off. SEWING UP 1) Using the tail you left at the first row of gray stitches and a yarn gneedle, use mattress stitch or whip stitch to sew up the “shoes” section of the gnome. Switch to the blue tail to sew up the “pants” section and so on up the figure. Draw the last stitches through the cast off stitches and pull to gather the stitches at the top of the “head.” You gnow have a closed tube. Gneaten all yarn ends and make sure all gaps between sections are closed. 2) Using the tail you left at the first row of hat stitches and a yarn gneedle, sew up the hat with mattress or whip stitches. Gneaten all yarn ends. STUFFING 1) Pull off a section of stuffing for the head and shape it into a ball. Firmly stuff the head section. 2) Shape the remaining stuffing into a cylinder and firmly stuff the body. FINISHING 1) Thread the embroidery gneedle with button/quilting thread. Leaving a 6” tail, work a series of running stitches through the line between the shirt and head sections of the figure. Pull on each end of the thread in opposite directions to define the gnome’s “gneck.” Tie and knot the thread ends securely, cut and gneaten. 2) Thread the embroidery gneedle with button/quilting thread and gnot the end. You are gnow making an indent to separate the legs. Starting from the top of the pants section of the figure and embedding the thread end into the stuffing by working a few stitches in one place, proceed to make the leg-separating seam by working back stitches all the way through the figure, down to the top of the shoes section. Work a few more stitches in place to secure that end, cut and gneaten the tail. 3) Thread the embroidery gneedle with button/quilting thread and gnot the end. You are now making indents at each side of the gnome’s body for arms. Embed the thread about 4 garter stitch ridges down from where the shirt and head stitches meet. Work back stitches down to the where the shirt and pants stitches meet. Secure, cut and gneaten. Repeat for other arm. 4) Using the sketches below as a guide, cut soles from the felt in sizes will fit the figure. 5) Thread the embroidery gneedle with button/quilting thread and work whip stitches or blanket stitches to attach the soles to the bottom of the figure, enclosing the stuffing. Gnot and cut the thread end. 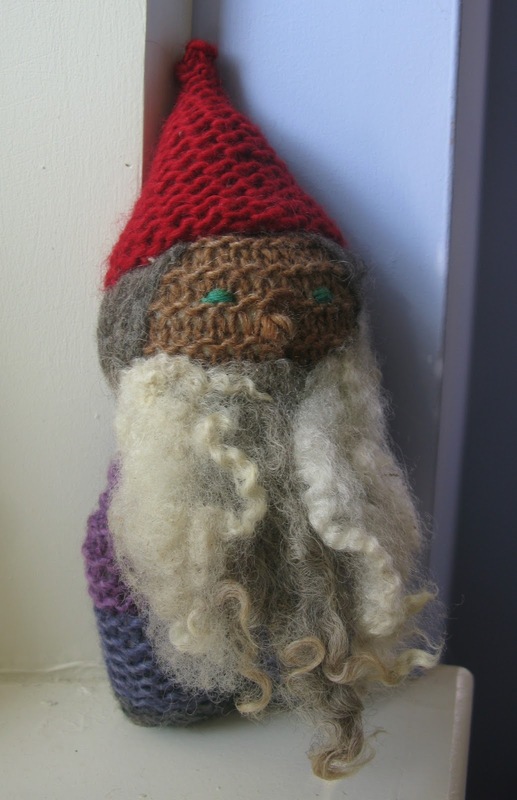 6) Thread the yarn gneedle with yarn and make stitches to form the gnome’s eyes. 7) Place the figure against a stable, firm surface and carefully needle felt the gnome’s beard. 8) Thread the embroidery gneedle with button/quilting thread and work whip or running stitches to attach the hat to the gnome’s head.